Video sharing sire Dailymotion has added support for the OpenID digital identity framework single sign-on and online user-authentication standard. The addition of OpenID support will enable Dailymotionâ€™s users worldwide to consolidate their account with other identities on the Internet. OpenID users can now link their OpenID to an existing Dailymotion account on a one-to-one basis, use their OpenID to initiate and simplify registration on Dailymotion or use their OpenID to log in to a linked Dailymotion account. Yahoo! announced its support for the OpenID 2.0 digital identity framework for all 248 million active registered Yahoo! users worldwide. OpenID, an open framework based on proven Internet technologies, enables users to consolidate their Internet identity, eliminating the need to create separate IDs and logins at all of the various websites, blogs, and profile pages they may visit in the course of their online session. In addition to the many leading Yahoo! services users already enjoy, anyone with a Yahoo! ID will be able to use the same ID for easy access to any sites that support OpenID 2.0. Yahoo!â€™s initial OpenID service, which will be available in public beta on January 30, enables a seamless and transparent web experience by allowing users to use their custom OpenID identifier on me.yahoo.com or to simply type in â€œwww.yahoo.comâ€ or â€œwww.flickr.comâ€ on any site that supports OpenID 2.0. Alternatively, web sites that accept OpenID 2.0 will be able to add a simple â€œSign-in with Your Yahoo! IDâ€ button to their login pages that will make it even easier for their users. Yahoo! is working with several partners, including Plaxo and JanRain, to make it possible for users to access these sites with their Yahoo! ID from the first day of the public beta. 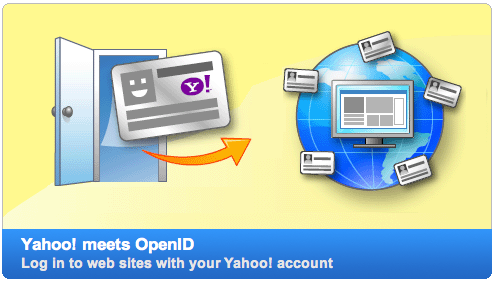 Yahoo!â€™s implementation is based on the OpenID 2.0 specification, which Yahoo! worked closely with the OpenID foundation and community to finalize in December 2007, and includes new features that improve security and usability of OpenID, making it the most user-friendly single sign-on and online user-authentication standard. Yahoo! users who log in with their Yahoo! ID on OpenID sites will have the added protection of Yahoo!â€™s sign-in seal wherever they go on the web. In addition, no email or IM addresses are revealed or disclosed as part of the login process, which further helps protect users from phishing or other attacks.